Our wide range of bathroom wall panels will enhance the look of any setting be it a bathroom or wet room and they're a great alternative to tiles. Their waterproof coating make them ideal for shower wall areas in the bathroom and for wet room installations. We have lots of bathroom wall panels available including marble effect, stone effect and slate effect finishes. Give your bathroom a real rustic appeal using these stylish designs or choose contemporary colours and finishes; stardust panels can add a touch of elegance to any modern bathroom. These bathroom splash panels provide style and function, as a water-tight, splash-proof finish for your bathroom. A versatile wall covering, bathroom wall panels offer a great way to break up the appearance of your bathroom, luxuriously highlighting the shower area. 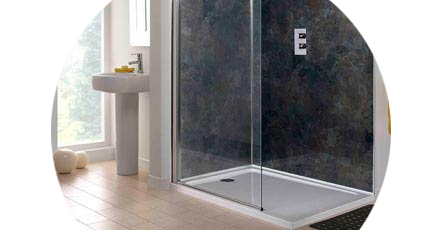 Our superb selection of bathroom panels enable you to create a fantastic looking shower surround that will also provide a safe and reliable backdrop.